we decided a cover might be nice for those times when we aren't using it for a fire. of 1" thick plywood we had hanging around. To make a circle I first found the center of the wood. I measured the width of the plywood, found the center, then attached string on a tack to the center point. I tied the other end of the string to a pencil and drew a big circle. I was careful to hold my pencil upright and honestly, for this project it didn't matter how perfect my circle turned out. 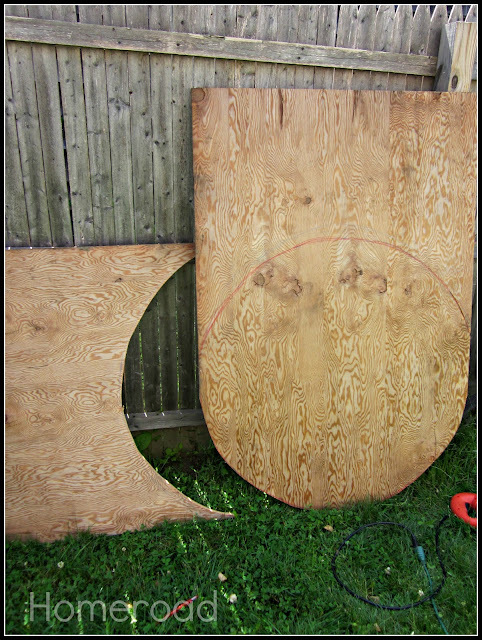 I used a jigsaw to cut the circle, then I trimmed and sanded all the rough edges. I laid it down on top of the fire pit, it was large enough to cover the center hole. *You may want to give the plywood circle a coat of Polycrylic or something that will protect the plywood from the weather. I covered the whole thing with a wildly awesome oilcloth tablecloth that fit over the top and draped down the sides perfectly! dry for the next fire, it even matches the oilcloth pillows on the chairs and the couch. This makes a great table to rest your magazines and drinks if you just happen to be off for the summer and plan on spending a lot of time out here. Neat idea, Susan! Now you can use it when it's not being used as a fire pit, too. Very clever! What a great idea. With the tablecloth on top it adds so much color and changes the whole atmosphere of your sitting area. So clever. I love that this cover could double as a picnic table. Nice job! That is such a cute idea! 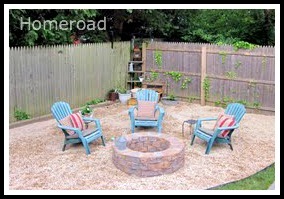 I love the fireplace pit cover! You always have the best ideas! PS I need to bring my paint pens to the beach, too! I know this is an old post, but I LOVE oilcloth and want to make some patio cushions and pillows. I have a concern: during the heat of summer, does your body stick to this like it would to plastic? THANKS! Your yard looks amazing! Thank you so much... and it looks much better since we got the new fence. (see that post too) Anyway I think the oil cloth might be better for table cloths because of the "stickiness" that might happen if it was on a chair. It would be easy to clean!